LIVE, the LIVE Interactive VDR Environment, allows a comfortable operation of VDR and some of its plugins trough a web interface. Unlike external programs, which communicate with VDR and its plugins through the SVDRP interface, LIVE has direct access to the internal data structures of VDR. This makes LIVE very fast. Additionally LIVE introduces an interface which allows the direct integration of user interfaces for VDR plugins. Currently this interface was implemented for the EPGSearch plugin. A substantial part of the LIVE web interface is based on this implementation. There exist plans to extend other plugins (like taste, burn, femon and others) with this interface too. LIVE works even when these plugins are missing. LIVE detects the available plugins and adapts its user interface accordingly. Therefor it can happen, that certain functions appear and can be used only when the appropriate plugin is activated in VDR. LIVE is distributed under the GNU General Public License, version 2(GPLv2). For more information follow the Link and/or see the file COPYING in the LIVE source code directory. This version of the LIVE plugin supports older VDR versions. It still uses the old Makefile format and thus can be used together with VDR versions older than 1.7.36. This will be the last stable version of LIVE offering this kind of support. Future versions of LIVE will work only with VDR version 2.0 and above. The following overview lists the most important user visible changes on LIVE since the last stable version. The major new features have been contributed by LIVE users. We are are very happy to embrace the contributions and thank everybody who helped in improving LIVE. The names of the developers are listed in the version history, which can be found in the LIVE-Git tree. A new simultaneous multiple channel schedule has been added. The channels can be grouped according to own preferences. The schedule for a channel group can be displayed on configurable time i.E. prime time. HTTP streaming of recordings if a version of tntnet > 1.7.0 is available. You browser still requires the mozilla-vlc plugin. More than one recording can be deleted at once. More than one recording can be moved or copied to a new location at once. The list of recordings can be filtered either for names or with regual expressions. All recordings folders can be expanded or collapsed at once. The main benefit of this feature unfolds in combination with the filtering feature. Works with the VDR developer versions (1.7.x) and is prepared for the upcoming VDR 2.0 release. Supports the new TS recording format. You can connect to LIVE via SSL. Enhanced support for EPG images which are supplied by external tools (e.g. 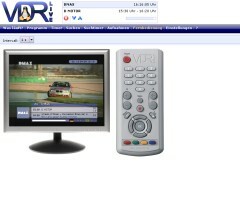 tvm2vdr.pl). Lots of little bug fixes (and perhabs new bugs). All past feature additions or changes of LIVE can be found on the News archive page. IMPORTANT: please allways have a look at the README file in the LIVE source code directory! Tntnet provides basic web server functionality for LIVE. Cxxtools is required by Tntnet. PCRE is used for the search with regular expressions on the recordings page. *) Boost provides TR1 C++ extensions and is required only when compiled with GCC < 4.1. Different versions of LIVE can be downloaded from the Download page. Additional contact information can be found at the top of the README file in the LIVE source distribution.